When I reviewed the 3/11 tribute book Tomo in March, the short story that immediately stood out to me for uniqueness and quality was Debbie Ridpath Ohi's Kodama. Written like a teen's sketchbook entry, it had a fascinating and twisty-turny storyline, and the accompanying illustrations added so much to the experience of reading. I wanted more from this Canadian sensation! So I was thrilled when I learned that she would have a children's book coming out! 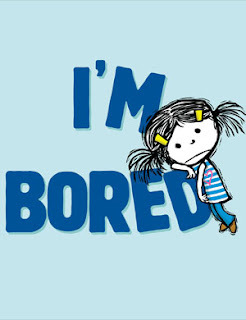 I'm Bored is the story of a young girl who is bored. Super bored. But she discovers what is awesome about being a kid through a little reverse psychology from a cheeky spud. Her imagination really takes flight but it is the twist at the end that takes this to a higher level! Michael Ian Black is a comedian and this is his fourth picture book. His dry wit and timing really work for kids. This book elicited a number of belly laughs from my daughter, and anything that can move that bowl full of jelly is okay by me. I love that he infused a little old potato with a lot of personality. Ohi's illustrations totally lived up to my high expectations. With a minimal colour palette (think My Name is Elizabeth) and pencil sketching she creates a feisty little girl in an inviting modern world. The sense of movement is amazing. She does the same thing she did in the Tomo, creating more depth in the story. I can't wait to see her next project. This is the twelfth book I have reviewed for the Sixth Canadian Book Challenge. Oh cool! Your review is certainly inviting! I'm looking forward to reading it asap! This sounds great. And I honestly love the simple cover.